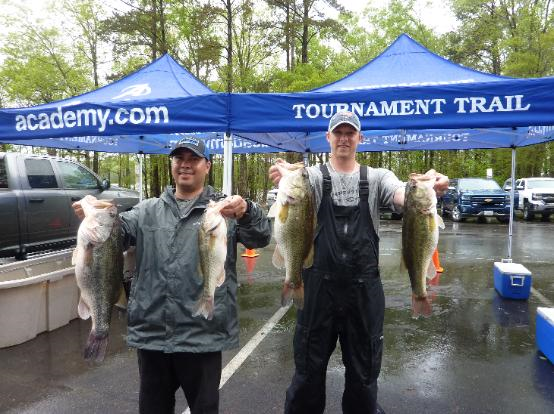 The 2nd Place team of Steve Jacobs & Keith Barker came close to winning with 5 bass weighing 20.44 lbs. and alstook Big Fish honors with a good 9.92 pounder!! They had $1,984 in winnings. 3rd Place & 2nd Place TWT was wonby the team of Alan Parker & Don Fuller. Their 5 fish weighed a total of 20.24 lbs. to give them $1,361 in winnings. 2nd Place Big Fish (9.85 lbs.) was won by the team of Keith Deal & Ricky Kenworthy for $1,134. Money got spread around good today again! 141 bass were brought to the scales by 47 of the 82 teams! The bite seems to be getting better but it’s far from being normal for this time of year because of the weather patterns. Jigs, Chatter Baits, crankbaits & spinnerbaits in the more shallow 2 to 6′ of water seemed to be the lures of choice. Ledge Rock Wildlife Ramp. This is an open event this year so all are invited. Please read the rules 1st.